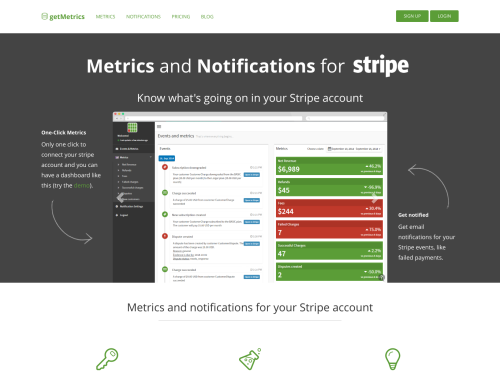 getMetrics is a service which makes it very easy to setup notifications for important Stripe events and provides a metrics and events dashboard. The service connects to your Stripe account with one click. You get instant notifications about important events in your Stripe account, right when they happen. You can choose which events should be routed to which email address. For example: Route all negative events like failed payments or subscription downgrades to your ticket system or issue tracker to make sure someone takes care of them. The metrics dashboard shows the most important metrics from your Stripe account like net revenue, refunds, successful and failed payments or disputes. Each metric has it's own detail page with further information. More metrics, for example subscription based metrics like Monthly Recurring Revenue (MRR), Customer Lifetime Value (CLTV) or User/Revenue Churn are currently in development.